Grant, H. M., Bredahl, L. C., Clay, J., Ferrie, J., Groves, J. E., McDorman, T. A., & Dark, V. J. (1998). Context-dependent memory for meaningful material: Information for students. Applied Cognitive Psychology, 12(6), 617-623. This is the contemporary cognitive psychology study which you will look at for your H167 AS OCR Psychology exam. You will also need this study for your OCR H567 A Level Psychology core studies exam. The theme of the cognitive psychology studies in the H167 exam is memory. This study by Grant et al., (1998) focuses on context-dependent memory. Context-dependent memory is a not a specific type of memory per se, but it instead it refers to the improved memory performance when individuals are tested in the same context in which they learned the tested material. For example, imagine learning your Psychology studies in a red room. According to previous research, you would be better off being tested in a red room than an other coloured room because of the benefits of context upon your memory. In this case, the matched context of the colour of the room. You might be even more aware of context-dependent memory than you thought. The effects of context-dependent memory make themselves known when you leave a room to do something or get something and then you forget what it was you intended to do, but when you return to the room where you began you remember what it was. What theory is the research based on? Godden and Badderly (1975, 1980) are seminal research papers in the area of context-dependent memory. Godden and Badderly noticed that deep sea divers would consistently forget things when they were underwater, but upon surfacing, they would soon recall the memory. This lead Godden and Badderly (1975) to propose the notion that memory is aided by context and they showed that deep sea divers would experience fewer issues with recall if they learned material in the same context, which they would later want to recall it in. The aim of Grant et al. (1998) was to demostrate the positive effects of context upon memory. Grant et al. (1998) used a laboratory experiment with an independent measures design. The participants were recruited by eight experimenters. Each experimenter recruited 5 participants each. The sample consisted of 17 females, and 23 males. The age range of the sample Grant et al. (1998) used was 17-56 years, which a mean of 23.4 years. One of the participants had their results removed from the study because they performed a level significantly lower than anyone else, meaning that data point was an outlier and would have skewed the results of the study. Each experimenter provided his/her own cassette player and headphones. The eight cassettes were exact copies made from a master tape of background noise recorded during lunchtime in a university cafeteria. The background noise consisted of occasional distinct words/phrases embedded within a general conversational hum that was intermixed with the sounds produced by movement of chairs and dishes. The tape was played at a moderately loud level. A two-page, three-columned article on psychoimmunology (Hales,1984) was selected as the to-be-studied material. 16 multiple-choice questions, each consisting of a stem and four alternatives were generated, all of which tested memory for points stated in the text. 10 short-answer questions were derived from those multiple-choice stems that could easily be restated to produce a question that could be answered unambiguously by a single word or phrase. The order of the questions on each test followed the order in which the tested points were made in the text. The short-answer test was always administered first to ensure that recall of information from the article was being tested and not recall of information from the multiple- choice test. The entire procedure lasted around 30 minutes. Each of the eight experimenters took one participant through one of the four conditions (meaning participants only took part in one condition) and an additional participant for one of the conditions as assigned by the instructor. Experimenters randomly assigned their participants to their five conditions. Participants were read aloud the instructions of the study, which described it as a class project and that participation in the study was voluntary. The participants in Grant et al. (1998) were then instructed to read the psychoimmunology article as if they were reading for a class project. They were also informed that their comprehension would be tested with both a short-answer test and a multiple-choice test. The participants were allowed to highlight and underline the article as they read. All the participants wore headphones while they read. Those in the silent condition were told they would not hear anything over the headphones whilst those in the noisy condition were told they would hear moderately loud background noise, but that they should ignore it. Having all the participants wear headphones regardless of condition is an example of a control measure implemented by Grant et al. (1998). By making all the participants wear headphones, the researchers can be certain that any results are not due to the wearing of headphones, as this was constant across the conditions. The participants’ reading times were recorded by the experimenters. This again is a control measure. A break of approximately two minutes between the end of the study phase and the beginning of the test phase was incorporated to minimise recall from short-term memory. Again, this is another control implemented by Grant et al. (1988). The test phase began with the short-answer test, followed by the multiple-choice test. Participants were tested in either silent or noisy conditions and were informed of the condition before testing. At the end of the testing phase the participants were debriefed concerning the purpose of the experiment. The data from one participant in the silent study/silent test condition were omitted from the analysis because his performance was over 2.5 standard deviation below the combined group mean on each test. Therefore although 40 people took part, only 39 results were analysed. Mean reading time (in minutes) and mean number correct on the two tests as a function of study condition and test condition. Results suggest participants in all groups spent roughly equal amounts of time studying the material. Therefore reading time was used as a co-variable in the analysis of test performance. Statistical analysis of the results suggest there a significant effect of studying and testing in the same conditions. The results also suggest there was no overall effect on performance. There are context-dependency effects for newly learned meaningful material regardless of whether a short-answer test or a multiple-choice test is used to assess learning. Studying and testing in the same environment leads to enhanced performance. 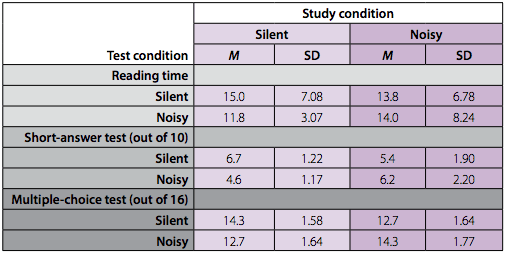 Students are likely to perform better in exams if they study for them with a minimum of background noise because, although there was no overall effect of noise on performance, the fact that there was evidence for context-dependency suggests they are better off studying without background noise as it will not be present during actual testing. + Ethics – the participants provided informed consent and voluntarily participated in the study of their own free will. Further, the participants were protected from harm and debriefed at the end of the study. Therefore the study was highly ethical. + Internal validity – both the methodology (laboratory experiment) and the high level of controls lead this study to be high in internal validity. + Predictive validity – the significance of the results and the large age range of the sample suggest that the effects of context of memory are robust and likely to occur in the future. However, the small sample does limit the extent to which the results from this study can be used predictively in the future. – External validity – the control measure of wearing headphones, although it increased the internal validity of the study, it somewhat decreased the external validity of the study because it is not common to wear headphones in silence. Revision materials for Grant et al (1998) into the effects of context-dependent memory, which you will need for your OCR H167 and H567 Psychology A Level exams.